In today’s episode of The Whole Circle Podcast Jo tells us all about how you can manage to still eat additive-free whilst long haul travelling. Recently Jo and Tracey travelled to America, in fact as this podcast episode was being recorded, Tracey and her family were still in America enjoying a family holiday. Thanks to eating additive-free while long haul travelling, Jo managed to avoid jetlag, feeling bloated and feeling really tired. Don’t get us wrong, she did feel tired at times because it was an overseas trip, but for the most part, she felt good. Jo has done a live Facebook video about her travel so you guys can head on over and check that out here as well as getting lots of other valuable content on their Facebook and Instagram pages. How did Jo travel to America and eat additive-free? The night before she flew out she spent an hour getting prepared. 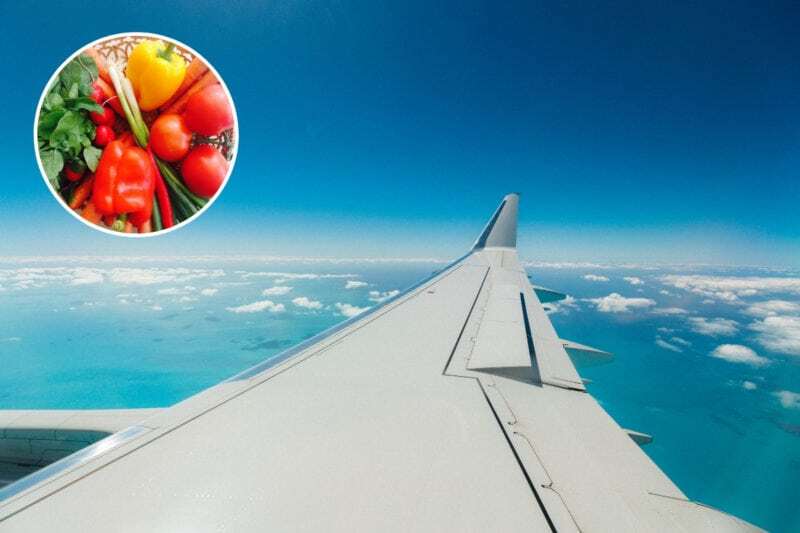 She went with foods that are really hydrating, because as we know, flying can dehydrate our bodies a lot more and in fact Jo found out that over a 10 hour flight our bodies can lose up to 2 litres of fluid! So staying hydrated is vital! Powdered velvet latte (which you can buy here). She took this in case she wanted a hot drink whilst on the plane as she doesn’t drink coffee, but coffee is really dehydrating to our bodies anyway. All Jo did was ask the flight attendant for a cup of boiling water and a little bit of milk and then she just mixed in her velvet latte sachet which was great. She also made sure she drank a lot of water as well by taking her 800ml water bottle which she refilled about three times. Doing all this was fantastic for her and really helped with how she felt travelling and once she had arrived. Are you allowed to take your own food and drink on the plane? You are not allowed to take anything over 100 ml into the airport, but once you go through customs you can fill up your water. Jo took an empty water bottle to the airport and then filled it up after she had been through customs. With the food you are allowed to take it on the plane, but you are not allowed to take it off the plane. Make sure you eat everything before you get off or make sure you throw it out otherwise you can get into some trouble when you go through customs at your destination. Because Jo was travelling on her own she did not have to worry about the kids and packing food for them, she was able to sit back and relax and she made sure she ate her own food. Whilst in flight she was offered a bag of pretzels which she thought would have been ok, so she looked at the ingredients and was shocked! There was about 15-20 ingredients but when she looked closer at the bag it was like a trail mix bag as it had pretzels, corn chips and some nuts and other things in it. There were colours, MSG with flavour enhancers, there was seasonings, emulsifiers, thickeners and all she could think to herself was ‘oh my goodness!’. Jo now translates ingredients into how it makes her feel and all she could think was how they were going to make her feel tired, headache, bloated, not feeling good at all. Since living additive-free her mindset has totally switched so now she consider how food will make her feel, ie. Does she want to get a headache? Does she want to stay awake because of the MSG? MSG gives Jo major leg cramps so of course she will stay away from that when she’s on a 15-hour flight because the last she wants is for her legs to be twitchy, achy and feeling awful. So if you are offered food on the plane, check their ingredients because it could make your flight a whole lot worse. It was well worth that hour prep she had done the night before flying out. Before Tracey went on her long haul flight she made a really yummy quinoa salad with some spinach leaves, quinoa, roasted sweet potato, seeds or nuts, shredded chicken and then a little container on the side with her salad dressing, she also made a zucchini slice, chopped up capsicum, carrots and snow peas. Jo also made up a fruit salad which she prepped the night before which consisted of cut up orange, apple and strawberries, again really hydrating foods with high water content. Doing this worked perfectly for Jo and Tracey given how well their bodies coped with the flight and when Jo got off the flight she felt pretty good and managed to stay up for the rest of the day and went to bed and slept all night and her body was then adjusted to the right time zone the next day. She didn’t have any jetlag, it was awesome! She did the same thing on the way home. Because she was staying in an Airbnb whilst overseas it made it a lot easier to prepare her food for the flight home. She could also have easily done the prep if she was staying in a hotel too. When packing your food for the flight home find a wholefoods/health food shop in the area you are staying and get a packet salad and already cut up veggies and fruit. We can all go to the effort to do this. This will save you having to try and find healthy foods at the airport which you will struggle to find. Jo couldn’t believe how much sugar was in American food which is a battle we need to keep fighting. Jo found a smoothie place when she was there which she was so excited about but the smoothie was all made with syrups and then she found one that had kale, lemon, peach and ginger which she purchased but all she could taste was sugar so she asked if there was sugar in it and the response she got was that the smoothie was based off lemonade! All she wanted was a healthy smoothie and she just couldn’t find it! So there you have it, that’s Jo’s hints and tips for long haul travelling additive-free which you can use for traveling either by car, plane or train. If you have found these hints and tips useful, please leave us a review as we really love reading the reviews that come in and then hit the subscribe button so then you are notified when new podcast episodes go live.